This is a beer I made with a view to entering it in a homebrew competition run by a local bar. I ended up pulling out at the last minute because I didn’t like what I’d been hearing about the way it was run. This is what 1.5kg of pureed cherries looks like. Because you’ve always asked yourself that, haven’t you? I was told they’d have brewery reps and professional brewers judging, but they ended up having the bar staff give 50 per cent of the score and the other half would come from the punters on the night. Which meant I likely knew more about beer than the people judging – which just seemed wrong. The straw that broke the camel’s back was hearing from a guy who had missed the last pale ale heat. The organisers told him he could just enter his beer in the final anyway. I heard that and thought, ‘‘nah, that’s me done’’. I put a lot of time and effort into brewing beer, and it just felt like this contest wasn’t respecting that at all. So I pulled the pin – which meant I could keep all the tasty Cherry Ripe stout to myself. And it has worked out very well. So well that I reckon it could well have won the comp – if I so say so myself. While it does resemble a Cherry Ripe chocolate bar it’s not a really sweet beer – at least not to my palate anyway. So maybe give this a beer a try sooner rather than later, because the stout weather is coming to an end. Spent grain… into the worm farm with you. 4) While the boil is going lightly toast the coconut in the oven by using the grill option. Keep an eye on it, because it can burn quickly. 5) With 20 minutes to go in the boil throw the coconut in the pot. 7) Once the wort is chilled enough to move into the fermenter, pour it through a strainer to remove the cherries and coconut. • My wort cooled down quicker than expected and so the cherries didn’t get much contact time with the wort. That led to the need to use a secondary fermenter for the first time ever – and that’s where I put the extra 900g of cherries, with the fermented beer siphoned on top. 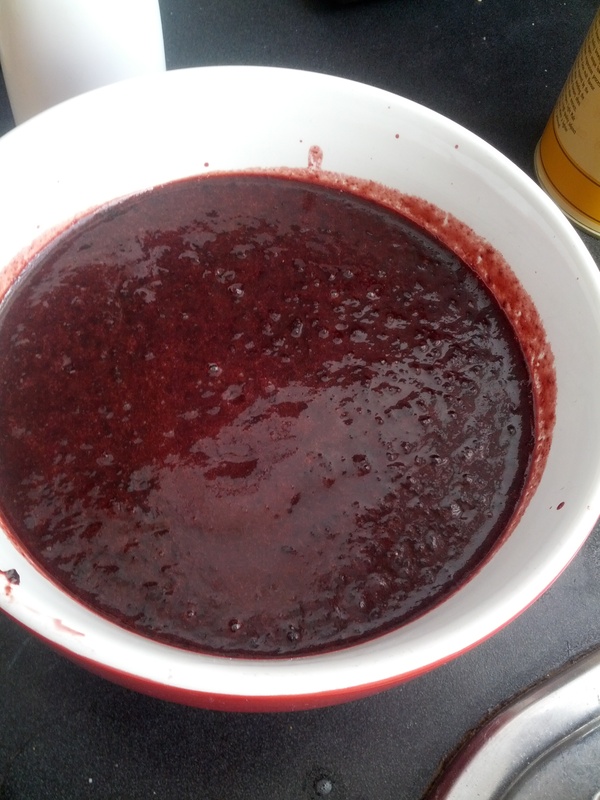 • If I did this over again, I reckon I wouldn’t bother with the pureed cherries in the boil and I’d go straight racking them over the fruit in the secondary. • I used frozen cherries from the supermarket. Seemed to work fine. • Toasted coconut makes the kitchen smell lovely. 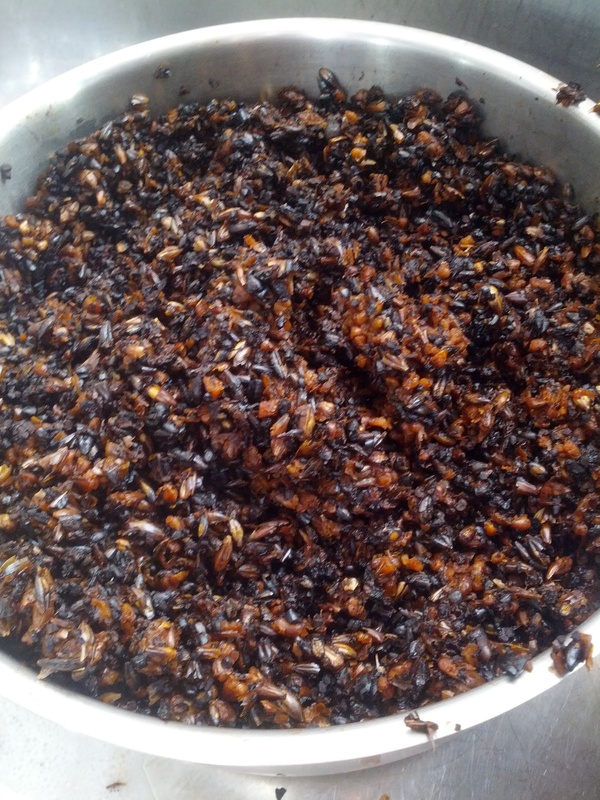 • Don’t use really finely chopped coconut – I found it too small to be caught by the strainer and ended up in the fermenter. And that can then lead to floaties in the beer. • My batch ended up at about 3 per cent alcohol. While I would have liked it to be a bit higher, it does mean I can enjoy this flavoursome beer without getting smashed. 3% seems quite low for the amount of malt involved and a “not a really sweet beer”. Wonder if the secondary on cherries is bumping up the gravity and concealing the true attenuation? Something has to be going on… because I get a few beers finishing around the 3-4% mark. Not that it really bothers me – I like a good midstrength beer. I’ve had a similar experience with my last couple of batches being under-attenuated, which is what triggered the comment. Was starting to wonder if the Safale yeast supply has gone bad but that would be a convenient excuse for my own brewing failings. I had thought I might have a dodgy hydrometer but that didn’t make any sense because it can’t be measuring the original gravity fine but getting the finishing gravity wrong. If it was faulty the measurements would be skew-wiff at both ends. mashing at 77c will not give any fermentables eh? That’s the temp I’ve taken from other recipes? Not hot enough?